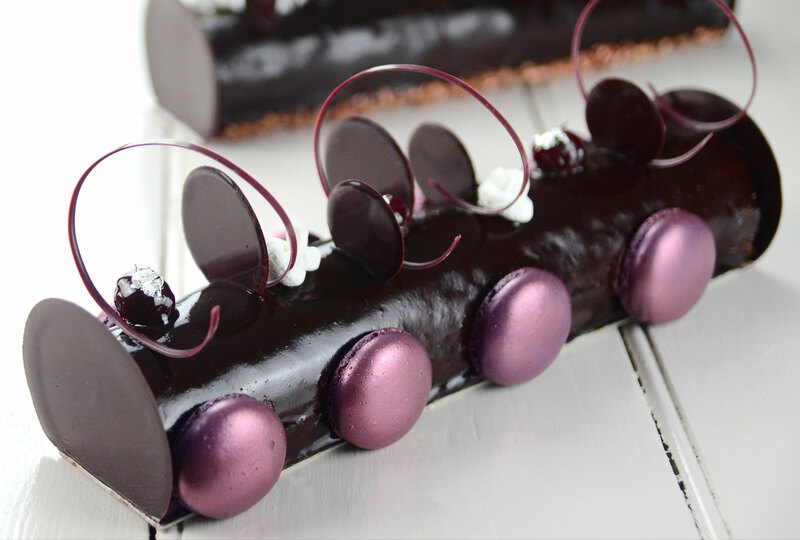 This modern take on the classic yule log is made with a soft chocolate genoise sponge, rolled with a rich cherry compote and chocolate ganache.The beautiful dish is finished with a chocolate glaze, tempered chocolate disks and macaroon shells, and would make the perfect Christmas showstopper. Preheat the oven to 180˚C. Whisk the egg whites until white and foamy, then gradually add in the sugar until a stiff meringue is formed. Blend the egg yolks and the oil together then fold into the meringue. Then, fold in sieved flour and cocoa powder until evenly incorporated. Divide the mixture in 2 and spread out onto 2 silicone mat lined baking sheets (30 x 40cm). Bake for 7-8 minutes or until cooked through. Remove from oven and slide the silicone mat onto a wire rack, cover with a clean dry kitchen cloth and cool. Do not remove silicone from the mat until ready to assemble. Add sugar and water to a pan and bring to boil. Allow to cool, then mix in the Kirsch. In a bowl blend the cornflour with a little juice from the cherries to make a paste. In a saucepan heat the remaining cherry syrup. Once the liquid is boiling add the cornflour mixture and re-boil until thickened, whisking continuously. Gently stir in the drained cherries, until coated in the thickened cherry juice. Pour into a clean dry bowl to cool completely before using. Place the gelatin leaves into a bowl of cold water until softened, about 5 minutes. Heat the sugar, water, cocoa powder and cream in a pan and bring to a boil. Remove the gelatin leaves from the water and squeeze to remove excess water. Remove the pan from the heat and add in the drained gelatin, blend with a hand blender and then pass through a fine sieve. Refrigerate until ready to use. Warm the purée and allow to reduce by half. Add the cream and glucose and bring back to the boil. Pour the hot mixture over the chopped chocolate and stir to emulsify. Stir in the softened butter. Mix with a hand blender or whisk to fully emulsify. Allow to cool then whisk again if necessary. Use immediately. Trim the chocolate genoise sponges into 2 rectangles of 30 x 40cm. Brush lightly with Kirsch syrup. Spread ¼ of the cherry chocolate ganache evenly over the top of each layer of sponge. Arrange thickened cherry compote along one edge, splitting evenly between the two sheets of sponge on top of the ganache layer. Roll up each of the sponges tightly to form roulades, starting at the edge where the cherries are laying. Place seam-side down onto a cake card and brush the outside of each roulade with the remaining kirsch syrup. Use remaining black cherry ganache to evenly coat the outside of each roulade. Ensure the ganache coating is smooth, then refrigerate until firm to the touch. Transfer the chilled logs onto a wire rack, with a tray underneath. Ensure the chocolate glaze is cool to touch and thick enough to have a coating consistency, then pour over each of the logs in one movement. Refrigerate until set, about 5 minutes. Repeat glazing stage again until good even coating is achieved. Transfer from the wire rack onto a presentation plate. Use a knife dipped into hot water to trim off the end of each log. Attach the tempered chocolate discs on each cut end with shiny side facing outwards. Place the macaroon shells evenly along the length of the roulades. To decorate the top of the roulade, position several evenly-spaced chocolate discs, chocolate twists, marshmallow knots, a few cherries and the macaroon shells along the length of each roulade. Apply a little edible gold or silver leaf to give the finishing touch.